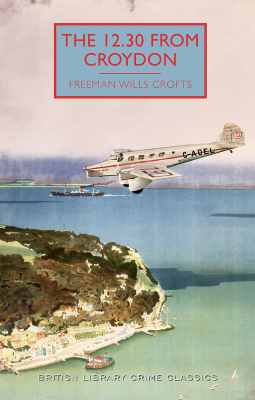 This is the second book by Freeman Wills Crofts that I’ve read. The first was Mystery in the Channel, which is a complicated murder mystery with plenty of red herrings and I had no idea about the identity of the killer. The 12.30 from Croydon couldn’t be more different – it begins with a murder but the identity of the murderer is known before he even thought of committing the crime. The result is there is little mystery, as Charles Swinburne sets about murdering his uncle, Andrew Crowther, in order to inherit his fortune. It’s set in the early 1930s when the country is suffering the effects of the ‘slump’ and Charles’ business is on the edge of bankruptcy, and he is unable to raise the money to keep it going. The major part of the book is taken up with describing how Charles became convinced that the only way out of his dilemma and the only way he could convince Una, a mercenary rich young woman, to marry him, was to kill Andrew. Consequently Andrew died on the 12.30 plane from Croydon. From that point onwards we see how Charles devised a plan and created an alibi that he thought would be perfect – and how it went wrong and how he was drawn into committing yet another murder. Inspector French appears later on in the book to explain Charles’ thoughts and actions, and how he broke his alibi, just as Poirot sums up his thoughts and methods of deduction in Agatha Christie’s books. The 12.30 from Croydon focuses on the psychology of the murderer and from that point of view I think it works well. Charles’ personality is thoroughly explored, showing his ingenuity, efficiency, and the ways he overcame his scruples about murder were in the main convincing. But the in-depth detail of the planning means that it is hardly riveting reading. So whilst the plotting is clever my interest in the outcome flagged as the only thing to work out is would Charles get caught out, and would Inspector French break his alibi. But I did want to know how it would end. What I found more interesting is the description of the thrill of the early passenger flights. In the opening chapter Rose Morley, Andrew’s young granddaughter flies to France with him and her father, Peter, because her mother had been knocked down and seriously injured by a taxi in Paris. Rose thinks the plane looks like a huge dragonfly. From her seat her view through the window was of the lower wing with its criss-cross struts connecting it to the upper wing. She was delighted by the whole process the increasing speed and the roar of the motors as the plane miraculously left the ground. Peter remarks that it was a wonderful improvement on the early machines when you had to stuff cotton wool in your ears. Rose loved the whole experience. I also like the setting Crofts created for the novel – the enormous pressure that drove Charles to take such drastic action due to the financial disasters of the period in the 1930s is well presented. I liked the book but as I enjoy trying to work out the why and the how for me it needed more mystery, and more red herrings. My thanks to Netgalley and Poisoned Pen Press for a review copy of The 12.30 From Croydon. It was first published in 1934; this edition with an introduction by Martin Edwards was published in 2016 by Poisoned Pen Press in association with the British Library. This is my first book for the What’s in a Name 2017 in the category of ‘a number in numbers’. This was such an interesting review. I’m quite intrigued by the notion of a whydunnit instead of a whodunnit.I don’t think I’ve read anything by him, though I have Inspector French and the Starvel Tragedy on my kindle. I do enjoy these BLC revived classics. My library has a few but not enough. Will keep an eye out for this one on my travels as I like the sound of it. On a more shallow note, I do love the quirky names of some of these early 20th. century authors. I have this tbr so looking forward to it now. I read another mystery by Freeman Wills Croft a few months ago called The Hog’s Back mystery which was good. Glad you enjoyed this, Margaret. Sometimes that element of psychology can work well. And I agree; it’s always nice to get a sense of history, isn’t it?